Oh, there could be so many funny photos that I could share with you that have the tag 'drink'. However, as this is (supposed) to be a blog about Being Mum and my journey through motherhood, I feel that it's more appropriate to share this photo instead. 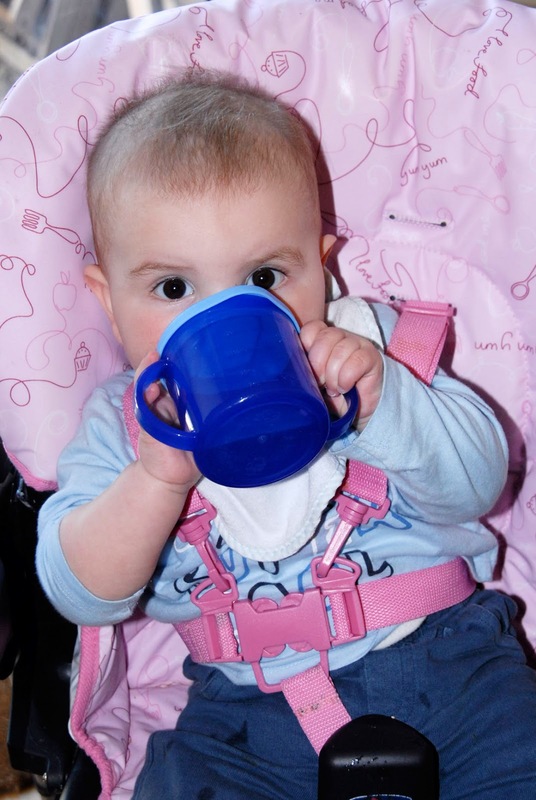 This is a photo of Toby using his cup properly for the first time. He picked it up and put it in his mouth and drank! Sounds pretty simple, right? He's becoming more coordinated as the days and weeks pass, slowly turning him from my tiny baby boy into a toddler. Although he's far from toddling, thankfully! This post is for The Gallery over at Sticky Fingers. Go have a gander at all the other drinkers. p.s. I know I'm a mean Mummy putting him in a pink highchair. Ah, bless him! My friend has a son who is now 10 and he used to walk around with fairy wings on ALL THE TIME when he was a toddler. He looked very cute!